I’ve been listening to a lot of podcasts lately; one in particular that has recently been added to my weekly list is “Books on the Nightstand”. The title is pretty self explanatory as it involves two people talking about what books they like while making a few recommendations to their listeners. 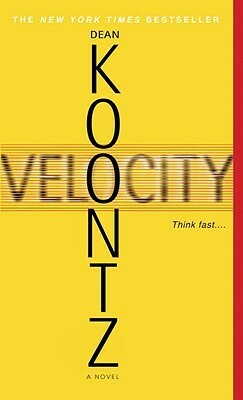 One of the first episodes I listened to gave me a recommendation to Dean Koontz’ Velocity. At this point, I’ve only heard the author’s name thrown around – I’ve heard nothing neither good nor bad about his style or any of his work so I thought I’d give it a shot. Billy Wiles is an easygoing, hardworking guy who leads a quiet, ordinary life. But that is about to change. One evening, after his usual eight-hour bartending shift, he finds a typewritten note under the windshield wiper of his car. If you don’t take this note to the police and get them involved, I will kill a lovely blond schoolteacher. If you do take this note to the police, I will instead kill an elderly woman active in charity work. You have four hours to decide. The choice is yours. It seems like a sick joke, and Billy’s friend on the police force, Lanny Olson, thinks so too. His advice to Bill is to go home and forget about it. Besides, what could they do even if they took the note seriously? No crime has actually been committed. But less than twenty-four hours later, a young blond schoolteacher is found murdered, and it’s Billy’s fault: he didn’t convince the police to get involved. Now he’s got another note, another deadline, another ultimatum – and two new lives hanging in the balance. Suddenly Billy’s average, seemingly innocuous life takes on the dimensions and speed of an accelerating nightmare. Because the notes are coming faster, the deadlines growing tighter, and the killer becoming bolder and crueler with every communication-until Billy is isolated with the terrifying knowledge that he alone has the power of life and death over a psychopath’s innocent victims. Until the struggle between good and evil is intensely personal. Until the most chilling words of all are: The choice is yours. The concept of this book intrigued me. I was all excited to get started; I’d only heard good things at this point. As I read on through the book – I was pleased. I even found myself recommending it to others before I finished it. However, as I got closer and closer to the end – I became less and less enthusiastic about finishing it. Around the last 70 pages; I just lost interest. I’m not going to go out of my way to say that it was predictable – but I didn’t understand why Billy held such strong conviction in who he thought the killer was. I didn’t quite get that – and when the whole plot came together and you DO find out who the killer is, it’s not very satisfying. I felt that Koontz’ Billy was not a fully realized character; I had a hard time feeling sorry for him. It’s not that I thought he deserved any of the mess that he was given – I just found myself not caring. There was enough substance to the book that I’m willing to give him another shot – I’ve been given a recommendation for another book of his (False Memory) and was told that this book was a poor place to start. Obviously the man is successful, so he knows what he’s doing – I just need to find something of his to enjoy. January 4, 2013 in Dean Koontz, Fiction.